Higher education conversation lead by Ryan Smith of The Education Trust - West (left) included California Community Colleges Chancellor Eloy Ortiz Oakley, California State University Chancellor Timothy White and University of California President Janet Napolitano (Photo Credit: Violeta Vaqeuiro/CA Fwd). 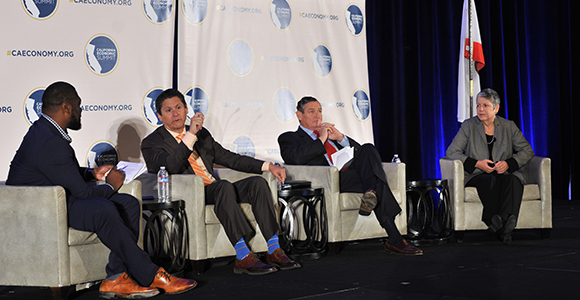 On day two of the 2017 California Economic Summit last week, the statewide gathering highlighted higher education as an important component to Elevate California, a new initiative to restore upward mobility in the state. And, to top it all off, the location of next year's 2018 Summit was revealed. Co-presented by CA Fwd and the California Stewardship Network, the Summit convened more than 500 civic, business and community leaders in San Diego. The day started with a panel of millennial and Next Gen leaders, who discussed how California’s economy and the high cost of living are affecting their peers. They also had advice for the higher education leaders who would later take the stage. “It’s important to know that we have a college system that doesn’t have room for everybody, even if they qualify,” said State Assembly member Autumn Burke, stressing that access to education should be a high priority. Burke added that many of those are students from disenfranchised communities. Panelist Sean Bhardwaj, founder and CEO of Aspire 3, suggested that colleges and universities need to teach entrepreneurship across disciplines, while Laura Clark of YIMBY Action urged institutions to make sure college students are registered to vote so they have a voice on issues including funding. Another conversation featured leaders from all three of the state's public higher education systems: University of California President Janet Napolitano, California State University Chancellor Timothy White and California Community Colleges Chancellor Eloy Ortiz Oakley. "Many of our students are food insecure & homeless. The entire ecosystem has to be supported," said Chancellor White." If we don't make this investment, it's a higher cost if we don't succeed." The Summit closed with a commitment to Elevate California by expanding opportunities for skilled workers, improving communities through alignment between housing, water, transportation and design, and creating one million more median wage and above jobs. "You cannot sit on the sidelines," said Oscar Chavez, assistant director at the Sonoma County Department of Human Services, who made the announcement that Sonoma County will be the site of the 2018 California Economic Summit. "This state needs you."